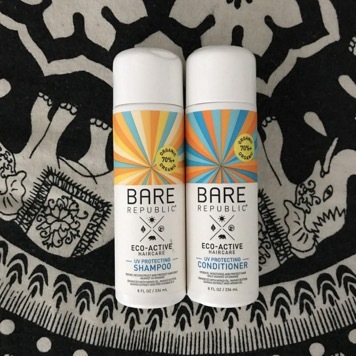 After enjoying a wonderful day at the beach we at MyTopFace thought that now would be a perfect time to try out Bare Republics UV Protecting Shampoo and Conditioner. If you’re a beach bunny who loves sunbathing on the beach and surfing all day, or if you’re tree hugger who enjoys soaking up Vitamin C and D, going on adventures and prefers the company of animals over humans, then this shampoo and conditioner combo maybe exactly what your hair needs to get through the summer. Bare Republic is a beauty brand that focuses on sun science and the harmful effects that UV rays can have on your hair and skin. It is already well known that leaving your skin unprotected from harmful UV rays play a crucial and important role in the development of skin diseases and skin cancer. You’ll be happy to know that some Bare Republic products can be found online or instore exclusively at Target. You can also purchase Bare Republic products from their own online store or from third-party vendors like Amazon, Etsy, etc. There are two types of UV rays. UVB rays are able to penetrate and burn through the outer more superficial layers of skin. Your outer layers of skin is where skin cancer develops and if your skin and hair are left unprotected from the sun it is more prone to develop sun spots, excessive dryness, thermal damage, stress, premature aging, and fine lines and wrinkles. UVA rays are able to penetrate deep into the skin’s deepest layer called the dermis. Bare Republic suggests using an SPF of 15 or higher to protect your hair and skin from both types of UV rays. The UV Protecting Shampoo is a sulfate-free and UV protecting shampoo that claims to deeply hydrate and replenish tired, worn down hair, while protecting it from thermal and saltwater damage and the damaging effects caused chlorine and other environmental pollutants. This shampoo is catered to all hair types and can even be used on color treated hair. This product’s new and innovative formula is made with 70.80% organic ingredients. The featured ingredients in this shampoo include aloe vera extract, quinoa extract, mango butter, monoi oil, and Pro-Vitamin B-5. Aloe Vera Extract is known to be able to repair and dead skin cells on the scalp because it contains proteolytic enzymes. These enzymes are able to eliminate dead skin on the scalp to prevent clogging of hair follicles and promote penetration of nutrients on the scalp and hair. If you color your hair Quinoa Extract can protect and maintain the color while also giving your hair extra strength and volume. Mango Butter has many benefits, but the one we’re most interested in right now is it’s ability intensely moisturize the scalp and hair. It is also beneficial because it is rich in antioxidants, fatty acids, and Vitamins A, C, and E. Last but certainly not the lease is Monoi Oil. Not only does Monoi Oil offer the hair UV protection it can also repair and restructure dry and damaged hair while giving it shine and improve your hair’s overall condition. Pro-Vitamin B-5 is a natural moisturizer for the hair that will improve its elasticity, its strength, and its overall health. The directions say to generously apply this product to wet hair. Evenly distribute the shampoo throughout your hair then gently massage the scalp to create a mild lather. Rinse out the product thoroughly from your hair then repeat the whole process again. To enjoy the full potential of this shampoo it’s suggested that it be used in conjunction with Bare Republics UV Protecting Conditioner. The shampoo’s fresh mango scent will remind you of the many reasons you should be enjoying the great weather we’ve been having here in NYC recently, and of why, in our opinion, summer and spring are the best times of the year. 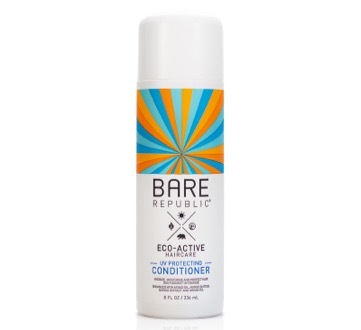 The UV Protecting Conditioner is also a sulfate-free and UV protecting conditioner that claims to deeply moisturize and protect your hair from the effects of heat styling and environmental pollutants. 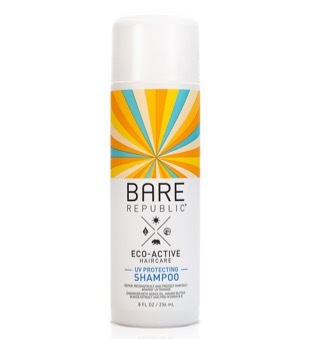 This product can also be used on all hair types and works best when used with the Bare Republic’s UV Protecting Shampoo. The directions say to apply a generous amount of product to wet clean hair from roots to tips, then to evenly spread the conditioner to penetrate each strand of hair. We at MyTopFace recommend using a wide tooth comb to distribute the conditioner throughout your hair as evenly as possible. Leave the conditioner on for 5-10 minutes, we suggest to place a shower cap on your head to trap in the heat and moisture from the shower, this will help the product to penetrate your hair more efficiently. Just like the UV Protecting Shampoo, this product’s uniques formula is also 70.80% organic. Some of which also include aloe vera extract, argan oil, quinoa extract, mango butter, and monoi oil. Many people already know the benefits Argan Oil has on the hair, but if you don’t Argan Oil has the ability to make your hair soft, silky and shiny. This is because it’s abundant in fatty acids, antioxidants, and Vitamin E, which help to reduce scalp inflammation and seal in moisture to the hair to prevent dryness. After a well-deserved trip to the beach, we at MyTopFace found these products to be lifesavers for our hair. We love the fact that these products accommodate many hair types and are also very affordable and easy to find and acquire. The shampoo gently but thoroughly cleansed our scalp and hair, while the conditioner deeply hydrated each strand emulsifying our hair in the abundance of nutrients and vitamins. Those of us with color or chemically treated hair found that these products left our thirsty tresses not only full of body and bounce but also feeling soft and looking shiny and healthy. They kept our colors or highlights looking vibrant even after several washes. As always, we really enjoy using products with organic ingredients that are also vegan-friendly and sulfate, perfume, cruelty, and paraben free. There aren’t many UV protecting haircare products readily available on the market right now, so we love the originality of these products. Using these products made us want to become more informed about the harmful effects UV rays have on our hair, and we at MyTopFace believe that it’s a problem that more people should know about.